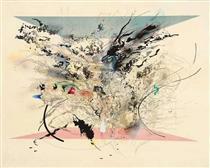 Julie Mehretu (born 1970 in Addis Ababa, Ethiopia) is an artist, best known for her densely layered abstract paintings and prints. She is best known for her large-scale paintings that take the abstract energy, topography, and sensibility of global urban landscapes as a source of inspiration. 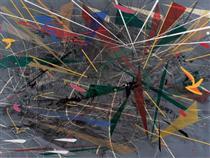 Mehretu was born in Ethiopia, in 1970, the first child of an Ethiopian college professor and an American teacher. They fled the country in 1977 and moved to East Lansing, Michigan, for her father’s teaching position at Michigan State University. 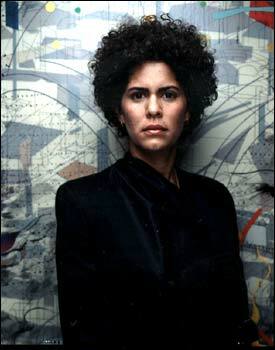 A graduate of East Lansing High School, Mehretu received a Bachelor of Arts degree from Kalamazoo College in Kalamazoo, Michigan, and did a junior year abroad at Cheikh Anta Diop University (UCAD) in Dakar, Senegal, then attended the Rhode Island School of Design in Providence, Rhode Island, where she earned a Master of Fine Arts degree in 1997. She moved to New York in 1999. 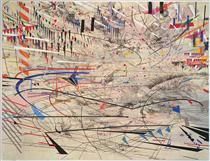 Mehretu lives and works in New York City. She shares her New York studio with her partner, the artist Jessica Rankin. Mehretu's mother-in-law is Australian author and poet Lily Brett and her father-in-law is celebrated Australian artist David Rankin. 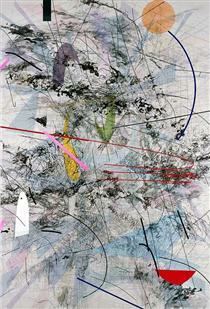 Mehretu is known for her large-scale paintings and drawings and her technique of layering different elements and media. Her paintings are built up through layers of acrylic paint on canvas overlaid with mark-making using pencil, pen, ink and thick streams of paint. Her canvases overlay different architectural features such as columns, façades and porticoes with different geographical schema such as charts, building plans and city maps and architectural renderings for stadiums, international airports, and other public gathering hubs, seen from different perspectives, at once aerial, cross-section and isometric. 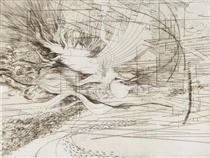 Her drawings are preparatory to her large paintings, and sometimes interim between paintings. Mogamma: A Painting in Four Parts (2012), the collective name for four monumental canvases that were included in documenta 13, relates to 'Al-Mogamma', the name of the all purpose government building in Tahrir Square, Cairo which was both instrumental in the 2011 revolution and architecturally symptomatic of Egypt's post-colonial past. The word 'Mogamma', however, means 'collective' in Arabic and historically, has been used to refer to a place that shares a mosque, a synagogue and a church and is a place of multi faith. A later work, The Round City, Hatshepsut (2013) contains architectural traces of Baghdad, Iraq itself – its title referring to the historical name given to the city in ancient maps. Another painting, Insile (2013) built up from a photo image of Believers' Palace amid civilian buildings, activates its surface with painterly ink gestures, blurring and effacing the ruins beneath. 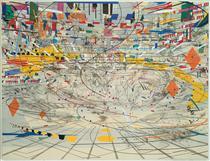 While best known for large-scale abstract paintings, Mehretu has experimented with prints since graduate school at the Rhode Island School of Design, where she was enrolled in the painting and printmaking program in the mid-1990s. 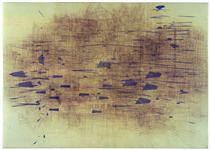 Her exploration of printmaking began with etching. She has completed collaborative projects at professional printmaking studios across America, among them Highpoint Editions in Minneapolis, Crown Point Press in San Francisco, Gemini G.E.L. in Los Angeles, and Derrière L’Etoile Studios and Burnet Editions in New York City. 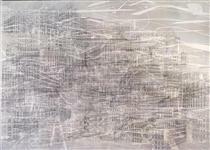 Black City Julie Mehretu ? Berliner Plaetze Julie Mehretu ? 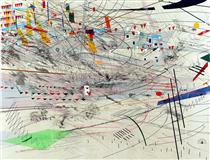 Empirical Construction: Istanbul Julie Mehretu ? Free range Julie Mehretu ? Grey Space Julie Mehretu ?